POCertify: Certifications have become a complex task right from the very beginning, and what makes it even more difficult is the trustability of it. In the case of halal certification, strict guidelines need to be maintained given that the Muslim population is dependent on it. POCertify simplifies the process for the suppliers of products along with given confidence to the Muslim population with the help of Blockchain technology thanks to decentralisation and it being independent of influences. The Halal certification is a process whereby the features and quality of products are according to the rules established by the Islamic Council, which further allows the Halal marking. The Muslim population is about 2.18 billion people across the world and estimations of one out of three people being Muslim in 2030 according to the statistics. The Halal market is estimated to grow from US $45.3 billion in 2016 to over US $58.3 billion by 2022. Islamic Finance accounts for 43% of the halal industry while the halal food market accounts for 36%. There have been many instances of halal certificates being wrongly justified. For example in 2011, Orion a Cold Storage in Cape Town, South Africa was accused of using halal labels on disapproved meat. Orion labelled halal on Kangaroo meat from Australia and Water Buffalo meat from India even though they were not approved by South Africa’s Muslim Judicial Council (MJC). The local halal market of South Africa faced a massive issue after Department of Islamic Development Malaysia (JAKIM) delisted the Muslim Judicial Council Halaal Trust (MJCHT) for not meeting various criteria. It reflected on a multi-billion dollar industry with the Islamic population in South Africa facing problems of food. JAKIM’s audits look into whether halal authorities meet international health and safety standards. The issues found included, tangible proof of implementation for training inspectors, monitoring and auditing reports. POCertify will help countries that face halal certification problems either in a more decentralised manner or using smart contracts to ensure that it falls in line with global Islamic practices. Many Muslim consumers have lost confidence in purchasing halal products due to the negligence and manipulation of the overall production and retail market. POCertify looks at solving to increase the trust factor for store owners, food and beverages manufacturers, restaurants and halal institutions so that their overall sales increase and their marketing efforts don’t go in vain. Even traders such as international importers and exports, along Abbatoir facilities of meat such as cattle and sheep, meat and poultry wholesalers will grow to prosper in ensuring the Muslim community is happy with their products and help develop their efforts into rightful sales. 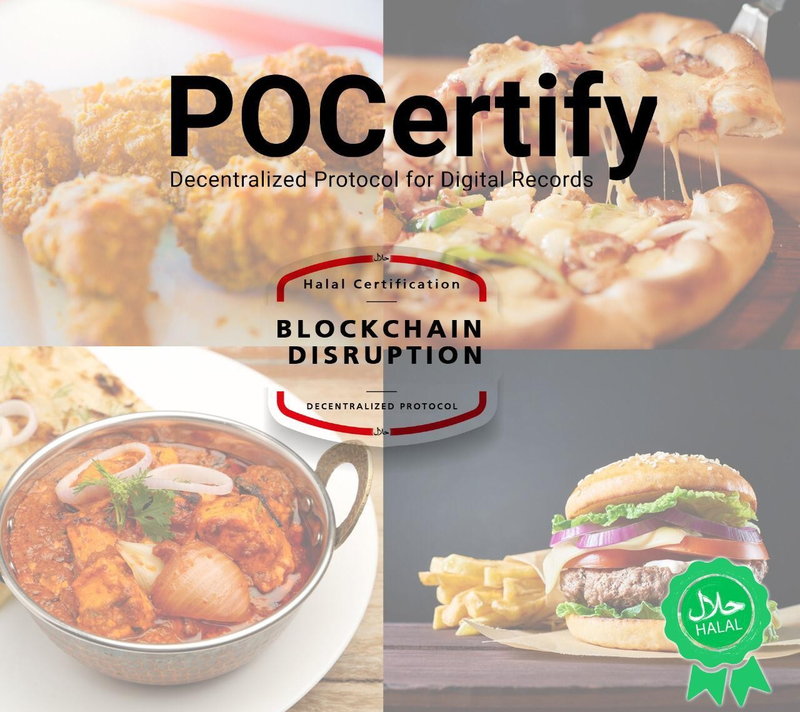 POCertify focuses as a decentralised application (dAPP) built using Blockchain technology and Smart Contracts technology which helps publish a Halal Certificate. 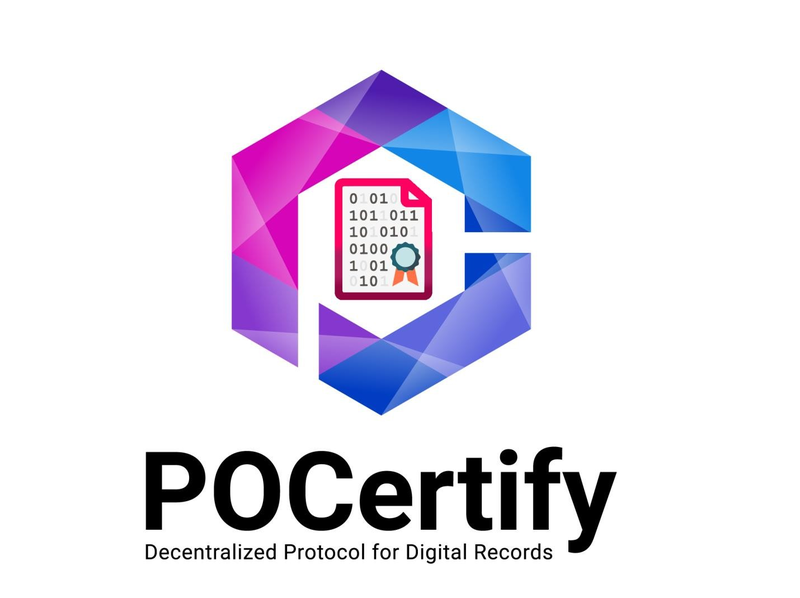 POCertify ensures justification on documents being produced as it is on a transparent, secure and decentralised platform of Blockchain with verification of a digital hash signature. Blockchain technology together with Islamic principles will digitally encrypt the Halal Certificat in it’s PDF Format and verify the Halaal certificate on the Blockchain. If it is correctly verified it proceeds to be used, and if not the producer or supplier is not given the certificate. Ownership is not claimed by anyone, ensuring that manipulation practices are entirely removed. An authentic and transparent system is enabled for the consumers, merchants and halal associations thanks to the proof of existence. Another advantage is the anonymity and privacy which prohibits modification through third parties or governments having hidden agendas. With no central authority, the Blockchain allows for the Halal certification to be available at all times unlike when a website is down due to maintenance issues. POCertify takes the process to an overall more sustainable model thanks to Blockchain technology. Shabeer Shaik Abdurahaman, Founder of POCertify, hopes to solve the Halal certification problem around the world. His 15 years experience in the Information Technology field includes certifications from renowned institutes like Google, IBM and Microsoft. 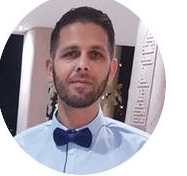 Shabeer is an energetic and tech savvy Entrepreneur who was introduced to Blockchain and Cryptocurrency when he started buying Bitcoins which led to purchasing Ethereum. He eventually wanted to understand the technology built on it, and so he ventured in Blockchain, Smart Contract Development and Cryptocurrency/Custom token product. His brainchild POCertify will adopt Blockchain for helping the halal process in the supply chain. His motive of thinking, creating and innovating is bound to change Islamic Fintech. POCertify consists of a team of different strengths and experiences that will help build a system of trust for a fully decentralised system of halal certification. POCertify has got advisors ranging from Blockchain Experts to look into the technological department, lawyers and shariah scholars to ensure everything is done as per halal requirements. The financial team consist of auditors to make sure finances are well organised and Entrepreneurs and consultants to keep the ideas blooming as POCertify believes that change is the only constant and believes in upgrading the system every time. With an Advisory board from Islamic countries such as Malaysia, Pakistan and Saudi Arabia to highly experienced halal markets such as South Africa and UK, POCertify is growing towards the right direction. A partnership with the Halal Research Council based in Pakistan is currently being negotiated along with 35 strategic partners around the world. With Islamic banking progressing, POCertify is looking at bringing the Blockchain technology and Smart Contracts to ensure Islamic Banking Tax Certificates, Insurance Contract Agreements and Islamic Sukuk and Investments are done in a halal manner. Even governmental and public documentation such as health certificates, educational certificates and architecture blueprints will be brought to the Blockchain front making it transparent and private for the necessary parties involved along with, so no tampering takes place. Overall POCertify is one of the most sought-after projects in the Islamic world improving the form of Halal Certification and Islamic Fintech.